Tonight saw another great episode of Coast, the unlikely smash hit from the Open University and the BBC. My favourite bit was a profile of 82 year old Wexford boatbuilder Larry Duggan, whose family has been building the Wexford Cot for generations. 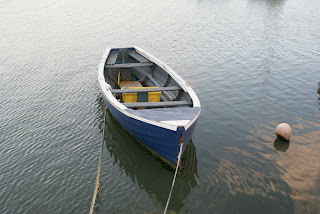 The cot is a flat-bottomed boat designed for fishing over the huge tidal mudflats of Wexford harbour, so minimal draft is the main design priority. The boat is rowed by two men each working one oar. The picture above is from the Flickr photostream of Alan Duggan. Larry Duggan also builds gun punts, a species of boat that this blog finds inexplicably fascinating. The punts are the standard canoe shape, fully decked, with a giant cannon pointing out the front. There was a sequence of the gun being loaded, which involves pouring shot down the barrel and banging the end on the ground to tamp it all down - how the thing didn't go off directly I don't know. When the gun was fired, the boat did not recoil like a Pentacostalist at a pub door. Was it firing a blank or is all that talk about gun punts shooting backwards hundreds of yards all balls? Duggan did claim he had downed about 50 birds with one shot, the kind of legendary bag that is regarded with scepticism by many. Henry Coleman Folkard in "Sailing Boats from Around the World" (6th Ed,1906), in the section on gunning punts, mentions a "patent spiral recoil-spring" fitted somehow to the gun mount, for dealing with the recoil problem. He also discusses how to best match gun, charge weight, boat proportions and weight, and crew weight to deal with the problem.